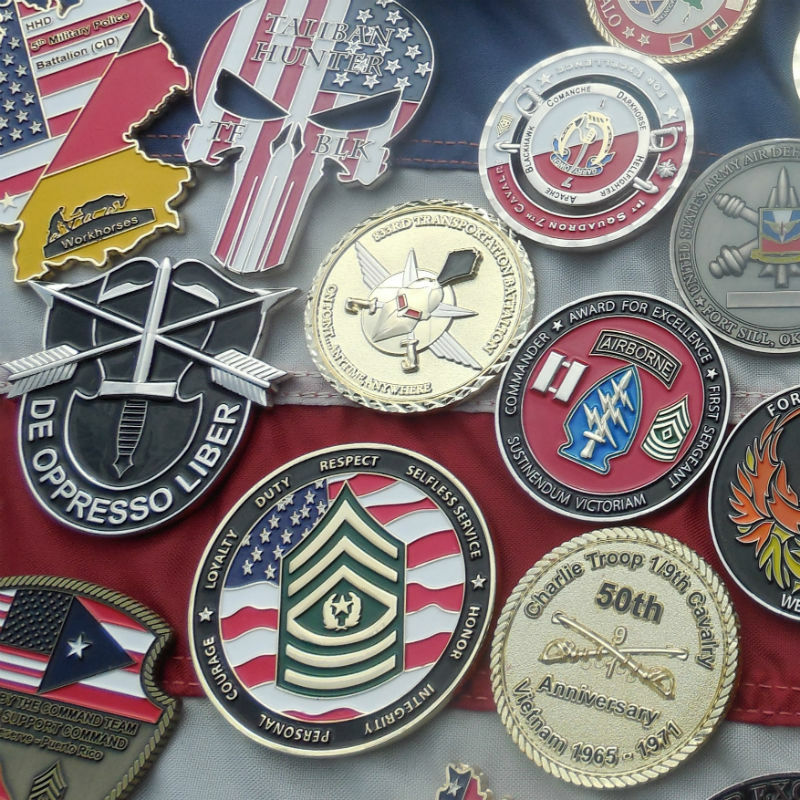 Welcome to our custom challenge coin design gallery! 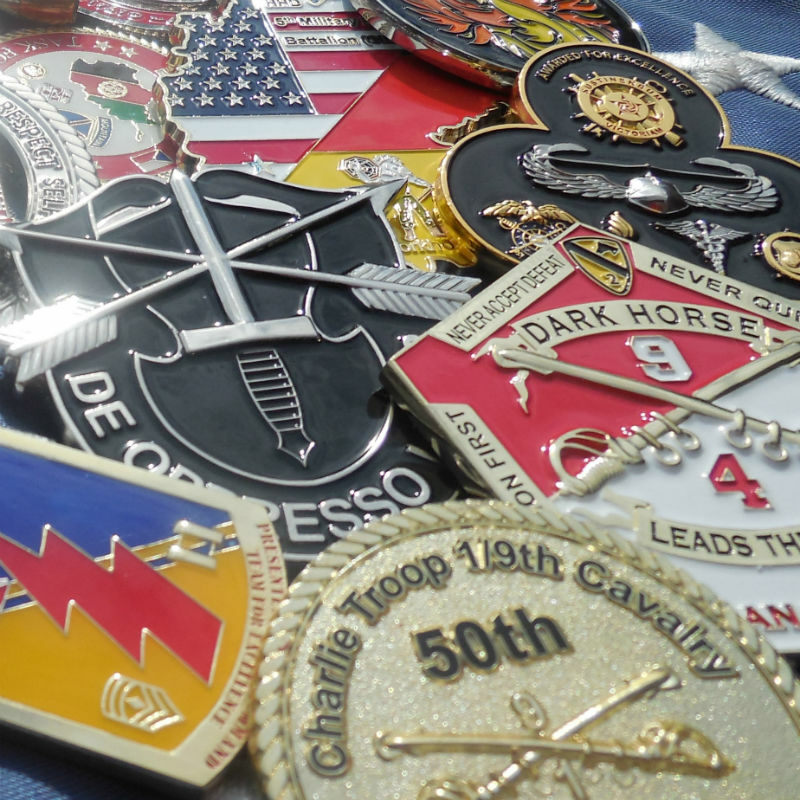 We take great pride in crafting custom challenge coins for our brave men and women. Here are some past designs that we are especially proud of. We hope these can be a starting point in your design process. 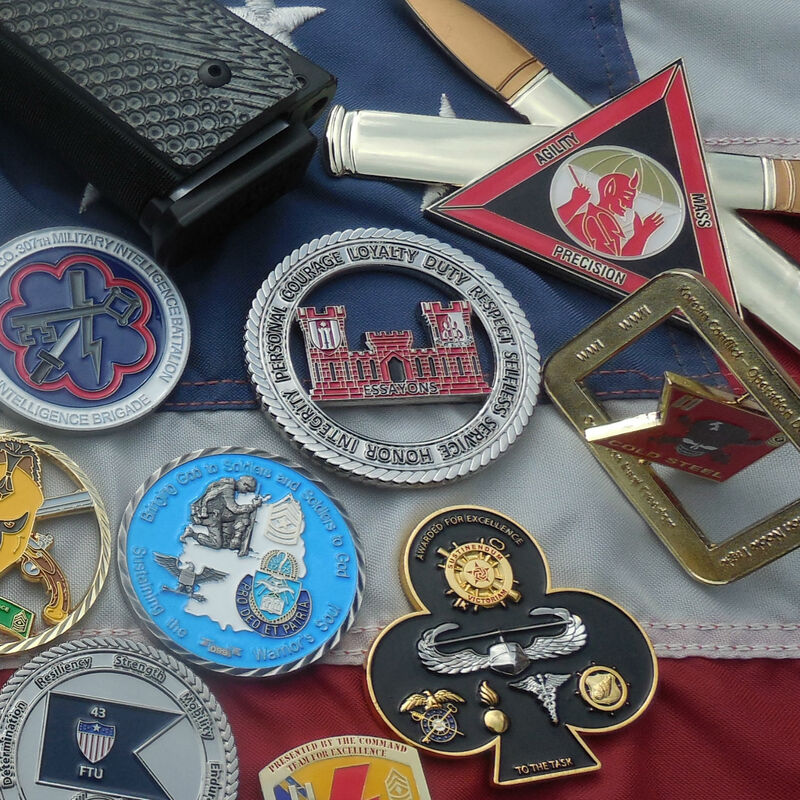 Our designers will help you craft the right custom challenge coin for you, all free of charge! We will do everything in our power to make your dream custom challenge coin a reality, including free unlimited design revisions! 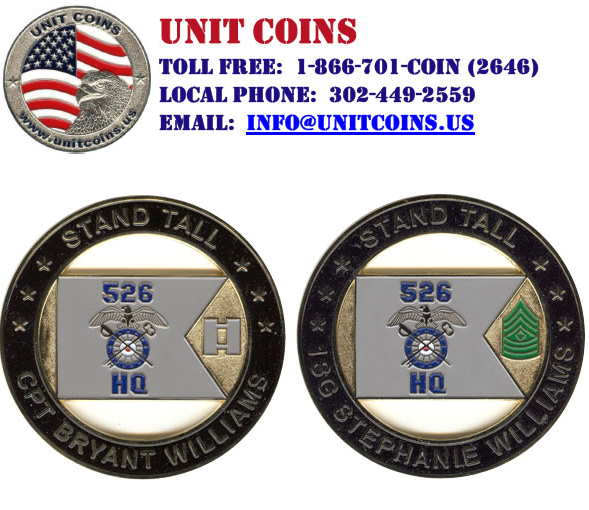 Give Unit Coins a call today and get a quote for your custom challenge coin. Welcome to Unit Coins design gallery. Long before we had fancy cameras we would scan in each coin and display them on our site to give new customers ideas for their coin design. Please use this as a resource for designing your coins whether it be the edging, plating, graphics or special shapes that we have made. Also please note these coins were scanned in and do not represent the quality of the actual coin. To see the quality and workmanship our current customers have come to rely on please visit our Custom Coin Gallery. Thank you for your business and thank you for your service! I want to inform you that I received the coins 100ea today. 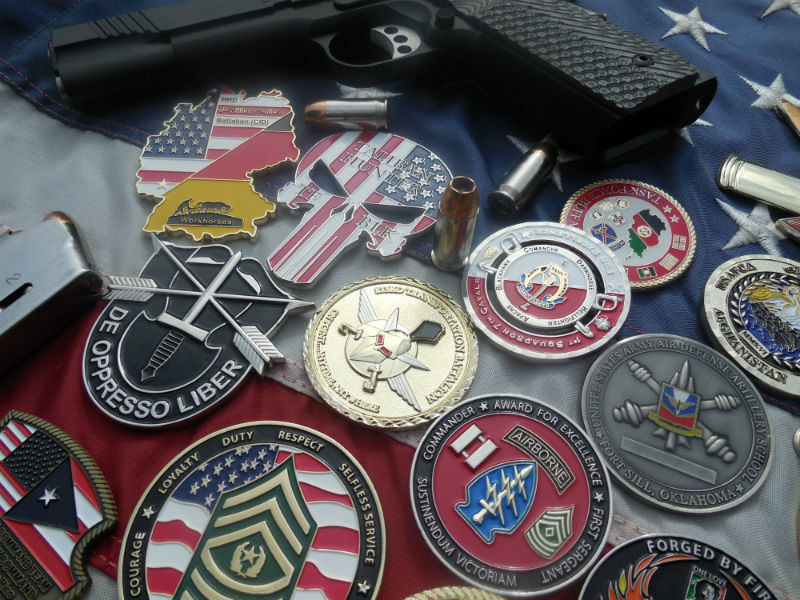 In behalf of our enlisted association I want to extend our appreciation for a wonderful job by your company. Hi Heather, Thank you for the coins, We really like them, ya’ll did a great job, We are out of here in 28 more days. The coins came in today. Everything looks great. I just want to let you know that we have received our coins and are very pleased. Thank you and we will be sure to pass on your company information to the next group in hopes they will come to you as well. Again, thank you! We received the coins today and wanted to thank you for your business and great quality of work! “I wanted to tell you that the coins look absolutely perfect and I recommended you to other campuses. Thank you for your excellent coins! You guys rock! I got the coins this morning. Thank you very much!! They are AWESOME! Got the coins this evening and my son-in-law has sent me photos. Even in his out of focus photos I am impressed. You all did a fantastic job re-creating our symbol. Thanks so much for working with me and thanks for your service! The coins just got here. They are FANTASTIC!!!!!!!. Thanks for all your help with these> I was wondering, if someone sees them and wants some of their own, can they just order them up? THANKS again for your work with these, I really appreciate it. I received the coins on Monday and they look great. Everyone that has seen them also agree that they came out better than what they thought from the drawing I showed them. Thanks for the great work again. I received the coins today. They look great. Good morning Heather, thank you very much for the coins they look perfect. Thank you for everything. I have received the two boxes. I thank you very much for the quick turn around and support. The coin is outstanding and will be of great personal value to all that receive it. Thank you Heather very much for the coins. I was home on leave and brought those with me forward so I can hand them our during a formal sit down with the unit once we are home soon in the near future going through demob station. They are incredible. Ma’am, today 29 September I received the coins that you shipped to us. I just want to tell you that they look AWESEOME! Everyone loves them…they are a little smaller than we wanted which was my fault since I changed it but they still look great. I also want to take this opportunity to thank you guys for all the patience and quick progression that you all performed. I am going home this Sunday so I will def pass on your company to the new personnel coming in. Thanks again for all your help. I’m sure we will do business in the future. Have a great day and ill talk with you soon. I received the coins today! This is awesome! Thank you so much! We received the coins and they look great!! Thank you. Thank you Heather I much appreciate your continuous efforts on this for me. It has been a pleasure using your company to do these coins for me. Truly with sincerity your customer service, rates highly on my account and I will pass on to other fellow friends your information so they too may use your services. The coins are a awesome. Thank you and your company so much for being so quick and professional but personable.